The two-floored café is decorated with quirky things from all over the city. The walls are covered in empty picture frames and the pillars have messages from everyone who has ever visited the restaurant, including famous people like Director Shankar! But getting a seat upstairs is definitely a better idea because the big windows looking out onto Dr. Nair Road to make the experience even better. Designed like a newspaper, the café’s menu has just been revamped to add more variety. Initially, they had the standard breakfast offerings (eggs, pancakes, and waffles), but now they’ve added some South Indian delicacies like the Kozhi Idli and Kal Dosa (you can get it with paneer or chicken). They even have a selection of Maggi dishes featuring everything from Chilli Cheesy to Tandoori Delight. But the section that gets the most attention is their saapadu. It is just as you would imagine, a full meal with rice and the works. 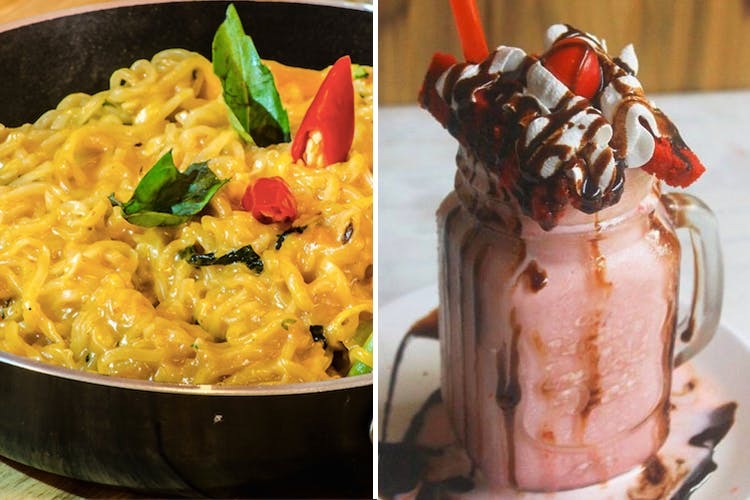 The Saapad section is split into vegetarian and non-vegetarian and there’s a variety of choices that you can pour over before you make your choice including Butter Chicken Biryani, Ghar Ka Khana and Soul Meal (rice with Malabar fish curry). Monster Shakes are becoming quite the popular trend and Café Central has them too (another new addition to the menu) with options like Popcorn Crunch (popcorn, ice cream, whipped cream, brownie and caramel drizzle) and the Valentino (slice of red velvet, ice cream, whipped cream and strawberry drizzle) to name a few.